My friend Mädi had asked me if I wanted to join her on a ski vacation to a place in the Swiss Alps called Bettmeralp. She was going with our friend René, her cousin Margrit, her daughter Anja, Anja's daughter Larissa and René's daughter Seline. I had a few hesitations... Herbert had to work and couldn't go, I didn't think my Swiss German was good enough to spend a week without English and I don't ski (big fear of going down a steep slope on two skinny pieces of wood and being out of control). However, I'm not usually one to pass up an opportunity - especially one that could be a lot of fun. I decided to go. I packed my bags full of things to do while everyone else was skiing. I took enough yarn to make a sweater, books I'd been wanting to read and a firm resolution to write the story about popcorn that I owed my brother and sisters from the previous summer. I had little time for any of it. Those that skied finished around 3:00. I met them at one of the main lodge/restaurants each day to play Jass - a Swiss card game that I love. After dinner each evening, we continued our Jass playing and laughed and played until we were exhausted. I found that both Seline and Anja could speak English and even when they weren't around, I managed to communicate in Swiss German. I would have had fun with Mädi, René, Margrit, Anja, Seline and Larissa no matter where I was. But, Bettmeralp was even more beautiful than I had expected it to be. We had an apartment with postcard-worthy views and sun filled blue skies every day. If Herbert had been able to go, it would have been the perfect vacation. Even though I never found the time to write my popcorn story, I did write it the following week and used the Bettmeralp setting as the background. If you're interested, you can find the story here. 4 - This is the view from our balcony. 5 - From the dining room window, you can see some of the ski lifts. 6 - The same view in the evening. 7 - Margrit and Mädi. 8 - Anja and Larissa. 9 - Seline and René. 10 - Every night but our last, we ate dinner together. Margrit is a professional cook and made most of the meals. On this night, we had fondue. Otherwise, it wouldn't have been a Swiss vacation. 11 - On two of the afternoons, we all met up on one of the highest points, called the Bettmerhorn. The altitude is about 2335 meters (7676 feet) The views from up there are even more incredible than from our apartment. If you click on the photo (for a larger view), you can see the Matterhorn, one of the most famous peaks in Switzerland. It's the pointy peak to the right of the center. 12 - This is the Aletschgletscher (Aletsch glacier). The flat part that looks like a river of snow is the glacier. It's 23.6 km long (14.7 miles) and the largest glacier in Switzerland. It starts at the Jungfraujoch and is sliding down about 200 meter (423 feet) every year. 13 - Most afternoons, we met at the Aletsch restaurant and sat on the terrace. The sun was so strong that, even though we were surrounded by snow, we were warm without jackets. 14 - Mädi, Margrit and me playing Jass while sitting outside at the restaurant. 15 - René didn't want to play cards. Instead, he colored with Larissa. 16 - We had bought a small bottle of whiskey to make Morel Mushroom sauce for dinner. We were going to save the rest for René. When he went to bed after dinner, we decided to drink it. We each had one whisky coke and we shared a bottle of wine. We laughed so hard while playing Jass that evening that when René came out of his bedroom around 11:30pm, he called us the "gigeli chickens" - a mix between Swiss German and English for 'giggling chickens'. The name stuck. 17 - It's very common for the Swiss to send postcards from their vacations and everyone signs everyone else's cards. This is Seline writing out her postcards from atop the Bettmerhorn. 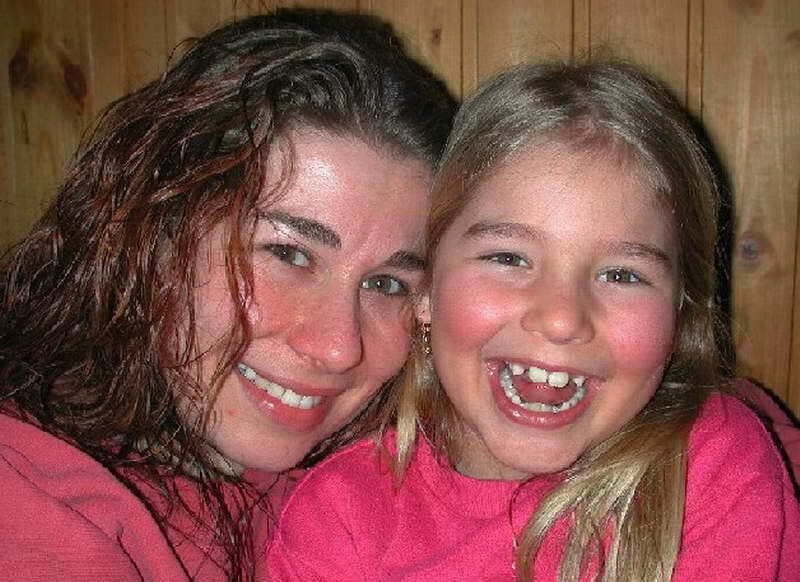 18 - Larissa, who was sick, stayed home from ski school a few of the days and slept on the sofa. 19 - Larissa, feeling better. She was watching for Seline, who was going to be hang-gliding over our village. We all wanted to take photos, but the winds were too strong that day and she didn't get a chance to go. 20 - After the sun went down in the evening, it got cold very quickly. We moved from the outdoor patio of the Aletsch restaurant to the warmth of this bar. 21 - All of us, next to the glacier. The peak over Seline's head is the Matterhorn. 22 - Me and Mädi. 23 - Seline and Larissa formed a friendship on our arrival and stayed that way throughout the week. 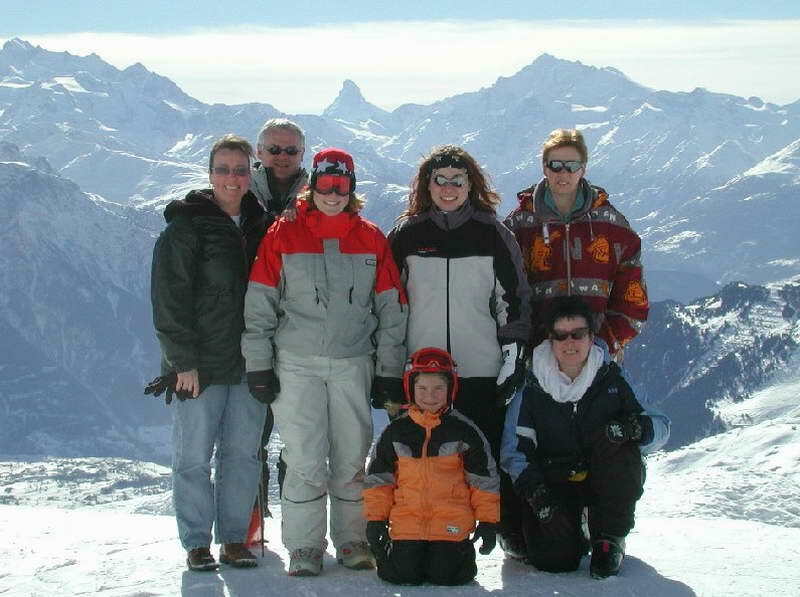 Seline had lived and worked in Bettmeralp before and has many friends there, but she always found time for Larissa. 24 - René with Seline's ski goggles and Larissa's teddy bear.